The mystery of Path’s mysterious growth deepens. The app, which has been around for nearly three years, miraculously jumped up the charts from between 500th and 600th place to the teens on the free list about two months ago. That raised questions about how the app was able to do that so spontaneously. Was it that Path finally suddenly acquired the network effects and organic growth that it had worked for years to trigger? Or was it something else? Valleywag speculated that it was spamming tactics plus spending on advertising, citing a graph from app and mobile ad tracking service Onavo Insights. The chart showed that an uptick in advertising spending that coincided with Path’s gradual rise up the overall charts. In fact, a source familiar with the spending habits of various top-tier mobile developers tells me that Path was the third highest spender on iOS app install ads on Facebook in the month of April behind the usual suspects like the top-grossing gaming companies. It then tapered its marketing spend down in May, and it also suffered slightly on the charts after Facebook shut down the app’s “Find Friends” ability. 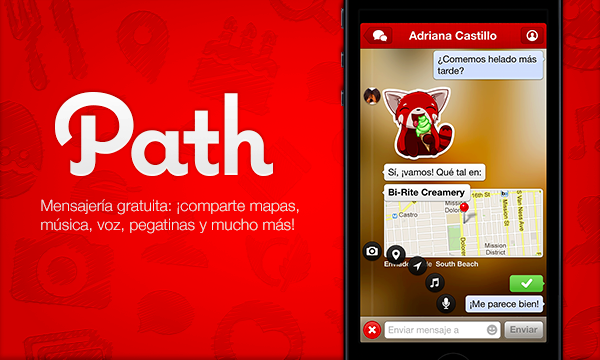 Path’s Facebook ad spending was also done in a clever way, with much of that spend being devoted to Spanish-language ads instead of English ones. We have an example unit at the top of the story, which appeared in the Facebook mobile feed and which Path put money behind earlier this spring. Not only that, if you dive into Onavo’s data, you’ll see that the highest correlating apps for Path usage in the U.S. are Mi Banco Mobile and El Nuevo Dia. Morin has talked about this publicly before, telling The Wall Street Journal that the company saw a spike in adoption in countries like Venezuela, Mexico and Puerto Rico. Path, for its part, is issuing its clearest statement today on its spending habits. It says it spends nowhere near what Valleywag claimed, which is more than $10 million in marketing over the last two months. There are a couple ways that you can look at this. If you took a more cynical point of view, you could argue that this is a way for Path to grow without industry observers and potential investors seeing that the company is doing potentially unsustainable user acquisition. If you took a more benign point of view, you could say that the messaging market already has leading contenders in Europe, North America, China, Japan and South Korea through companies like WhatsApp, KakaoTalk, WeChat, Facebook Messenger and Line. While WhatsApp does have a lead in Latin America and other Spanish-speaking markets, perhaps this could be a savvy way for Path to lock down one of the last regional markets that’s vulnerable to a newcomer. To be fair, I also think that Valleywag’s headline about Path “cheating” its way to the top of the charts is overblown. Spending money to advertise your product is not a sin. The majority of companies at the very top of the grossing lists do this every day. It’s a form of arbitrage: spend X amount of money to bring in a user, and earn Y from them over their lifetime of playing a game, buying Groupons or stickers or whatever else. Mobile gaming companies like Supercell and Kabam have dedicated “user acquisition” teams that can spend millions of dollars per month on this type of marketing. If Path is presumably earning enough revenue from sticker sales to justify this spending, it’s not really a problem. But spending money on marketing in an ROI negative way is problematic if you intend to build a sustainable business — which could be an issue if the company moves forward with early-stage fundraising talks that could value it in the high hundreds of millions or even a billion dollars.